A few years ago, I received, because I was on her email list, an inspirational true story from a famous speaker. I loved it. What's more, the story seemed like a perfectly timed gift, one that fit in with a sermon I was working on for the following Sunday's worship. As I crafted my sermon on Friday, I worked in the story. On Sunday, I preached and the story had precisely the impact I'd hoped it would, aptly illustrating the point I wanted to make. But that afternoon, shortly after I'd posted the sermon on my blog, I decided to check my email first. There was another email from the famous speaker. She apologized to her readers, saying that the story she had shared with us earlier in the week, one she thought to be true, was a fabrication. The preacher's worst nightmare--or that of any speaker who wants to persuade people of something--is to present as true a story that isn't. It makes people doubt what you're trying to convey. No preacher--no public speaker--can claim to be perfect. I own the reality of my own imperfections to my hearers all the time. But people do have the right to expect that when I say, "This is a true story," it really is! Not that every story we tell has to be factual. In fact, I try always to label my stories for what they are, in advance. They're either true or something like parables, stories crafted to convey deeper meanings, what Texas preacher Gerald Mann calls "truth stories." Jesus used parables all the time. (See here and here, for examples.) In fact, Jesus customarily used an inductive method of communication, often employing these stories He composed or adapted to put people into the middle of realities about life and God He wanted to convey. Among modern US politicians, Ronald Reagan was a frequent user of parables, including jokes, to communicate his vision for the country. This morning, the Columbus Dispatch ran a story about an untruth told by Senator Hillary Clinton out on the campaign trail. No, I'm not referring to the Bosnia sniper story that unbeknownst to me as I read today's Dispatch, to which the Senator's husband had attached new media legs on Thursday. This story which Senator Clinton has told more or less innocently (more on that in a moment), on the campaign trail both here in Ohio and more recently, in Pennsylvania, as though it were true, has now been determined to be laced with a fatal blend of added falsehood. The story revolved around a southern Ohio woman who died last year. Trina Bachtel died after giving birth to a child, who had also died, both deaths attributable, Clinton said, based on what she had been told, to the woman's inability get health insurance. Clinton had gotten this version of the Trina Bachtel tragedy from an apparently well-meaning Meigs County, Ohio deputy sheriff back on February 28. The problem with the story as told to and by Clinton is that Bachtel had insurance. Most of the rest of the story as told to and by the Senator was also untrue. As it turns out, almost none of what Clinton said was accurate. Bachtel was insured through her job managing a pizza restaurant, she was under the regular care of an obstetrics facility in Athens, and she had been part of the O'Bleness Health System in Ohio. Despite allegations by some critics, Clinton did not invent the dramatic facts but instead passed on to her audiences a reasonably accurate version of the story told to her Feb. 28 by a Meigs County deputy sheriff. But a Clinton spokesman acknowledged this month that the campaign did not "fully vet" the story and that Clinton would no longer repeat it. In addition, news organizations -- including The Dispatch -- did not promptly examine the facts of the story to determine whether it was accurate. Not until Saturday -- more than a month after the Ohio primary -- did T he New York Times report that the woman was insured and had been under the care of an obstetrics practice. "While it is a fundamental responsibility on the part of a campaign to vet a story to make certain it is accurate, it also is the media's responsibility to verify and check out stories," said Mark Jurkowitz, a former media writer at T he Boston Globe and now associate director of the Project for Excellence in Journalism. "As far as journalism's role, it's clear: We're not stenographers." I hold Clinton and her campaign partly innocent. But only partly. Health care is a serious issue in this campaign and one about which Clinton obviously has strong feelings, going back at least to her days as First Lady. The Bachtel tale as told to Clinton buttressed all that the Senator believes to be unjust about health care in this country and that frightens the millions of Americans who are uninsured or who worry about not having enough insurance. Bachtel was manager for about six years of the Gallipolis Pizza Hut, where her benefits included health insurance, said Stanley Jarvis, a regional manager for the restaurant chain and a friend of Bachtel's. In 2005, she joined the O'Bleness Health System in Athens, according to Linda Weiss, a spokeswoman for O'Bleness. During her pregnancy in 2007, Bachtel was under the care of River Rose Obstetrics and Gynecology, which is part of the O'Bleness system and across the parking lot from O'Bleness' hospital in Athens. According to Jane Broecker, an obstetrician at River Rose, Bachtel made 14 visits between Feb. 8 and July 31. "She came regularly for appointments," Broecker said. In addition, records made available by O'Bleness show that Bachtel visited the hospital seven times in 2007 on an outpatient basis. Six of those visits took place on the same day she had been at River Rose. On Aug. 1, Bachtel was admitted to O'Bleness, where her baby boy was stillborn. Two days later, she was transferred to Riverside Hospital in Columbus and finally to Ohio State University Medical Center, where she died Aug. 15. Bachtel died of adult respiratory distress, with pneumonia and liver failure contributing to her death, her death certificate says. Broecker said that even if Bachtel had not been insured, she would have been treated at O'Bleness. "The hospital is a charity provider," Broecker said. "We don't turn pregnant patients away." Bryan Holman, the 40-year-old deputy sheriff who told Clinton about Bachtel when he hosted the presidential candidate in his mobile home, could not be reached for comment. But Susie Casto, Bachtel's aunt, told the Pomeroy Daily Sentinel that she had suggested to Holman that he tell Clinton the story to "let people know that there is a need for more health-care services in this area." But in retelling the story, Holman and Casto got several key details wrong. For instance, Holman told Clinton that Bachtel had no insurance. Tracy said the stories of her sister not having insurance were "a big misunderstanding. She always had health insurance." And if you're a communicator, always check your facts. That goes for politicians as much as journalists and preachers. Then, resign yourself to the fact that sometimes, in spite of the best of intentions and the hardest of work, you still will sometimes get it wrong. "We have a health insurance crisis in our country. It must be dealt with. it is a scandal that in a land of plenty, with the best health care professionals and technology in the world, anyone should suffer unnecessarily or not have access to health care. I never said anything to contradict that in this piece! O God our shepherd, you know your sheep by name and lead us to safety through the valleys of death. Guide us by your voice, that we may walk in certainty and security to the joyous feast prepared in your house, through Jesus Christ, our Savior and Lord, who lives and reigns with you and the Holy Spirit, one God, now and forever. 1. The Fourth Sunday of Easter is always Good Shepherd Sunday on the Church calendar. The Gospel lessons for these Sundays are all different for the three years of the Church Year. But all come from John 10. 2. The first lesson for the week, as is true throughout this Easter season, is from the New Testament book of Acts, not an Old Testament book, as is usually the case. More on that text below. 3. The Acts passage and the one from First Peter present an interesting contrast. We read that in the very first days of the Church's life its members enjoyed "the goodwill of all people," maybe not to be taken literally, but certainly reflective of the high esteem in which the first Christians were held. Having come through Jesus' crucifixion and resurrection and the first Pentecost with their faith not only intact, but made stronger by God, they were appreciated by the Jerusalem community. But by the time Peter writes his letter to the dispersed churches of Asia Minor (modern day Turkey), Christians are subject to official persecution and social shunning. Peter writes his letter while imprisoned in Rome. It had become illegal to be a Christian, the Church's confession, "Jesus is Lord," called atheistic, because Christians would not acknowledge either Roman deities or the emperor as "Lord," ultimate boss. In any and all circumstances, whether accepted or not, Jesus Christ is our Lord. 4. Three of the four appointed Scripture passages refer to Christ as our shepherd. It's a little tough for us today to identify with this imagery. Even few people who live in the countryside these days have much connection with livestock. More on the possible meanings of the imagery below. 5. Acts 2:42-47: The text begins on the first Pentecost. By this point in the narrative, Peter has preached, the people have asked what they must do to be reconciled with God and so have life, Peter has told them to repent and be baptized in Jesus' Name, and 3000 heed this call, powered by the Holy Spirit. The text tells us then about something of the life of the early Church and how those around them responded to it. 6. Two things especially should be noted here, I think. First of all, the first Christians, through the power of the Holy Spirit in the Church, were engaging in the wonderworking that made up part of Jesus' ministry. Jesus never performed His signs or miracles in the same way twice and there were a diverse numbers of signs He performed. There was a similar diversity in the signs performed by the early apostles. As applied to church life today, I think that it's important for us to remember that, through the Holy Spirit living in Christians, Christ is still in the miracle making business. But it is, in my estimation, to think that miracles, meant to be signs of Christ's lordship over sin and death, are meant to be commonplace. As someone has said, if miracles happened all the time or any time we took it into our heads that they should happen, we wouldn't call them miracles; we'd call them ordinaries, as in ordinary, everyday stuff. Furthermore, the unique character of each Biblical miracle should caution us against ready acceptance of the absurd spectacle, seen on some televangelist's shows, of assembly line miracle working, seemingly desperate souls, "slain in the spirit" by microphone-wielding charlatans who "heal" all comers in precisely the same way. ...you will receive power when the Holy Spirit has come upon you; and you will be my witnesses in Jerusalem, in all Judea and Samaria, and to the ends of the earth. After the Spirit came, Jesus said, the Church would be empowered to do its mission in the world, being His witnesses with the aim, of course, of making disciples. After establishing itself in Jerusalem, the Church called the Spirit's prompting to move out in Judea at large, then to Samaria, the onetime "Northern Kingdom," and to the ends of the earth. I like the way Leonard Sweet describes the mission of the contemporary Church. We are to be "glocal" about our mission, local and global. We begin, in the case of Saint Matthew, with Logan. But we also reach out to Hocking County, the United States, and the world. We do that not only with the dollars we give to local ministries, the World Hunger efforts of the Evangelical Lutheran Church in America, and so on, but also through our personal participation in sharing Jesus right here. In the ancient Near East, the king was seen as shepherd (vv. 1-4) and as host (vv. 5-6). God faithfully provides for his sheep, and constantly cares for them. He revives our very lives (“soul”, v. 3), and guides us in godly ways (“right paths”). Even when beset by evil (“darkest valley”, v. 4), we have nothing to fear. God’s “rod” (a defence against wolves and lions) protects us; his “staff” (v. 4, for rescuing sheep from thickets) guides us. The feast (v. 5) is even more impressive, for it is in the presence of his foes. Kings were plenteously anointed with oil (a symbol of power and dedication to a holy purpose.) May God’s “goodness and mercy” (v. 6, steadfast love) follow (or pursue) him (as do his enemies) throughout his life. He will continue to worship (“dwell ...”) in the Temple as long as he lives. First Peter, one of my favorite books of the Bible, is a letter meant to be circulated among Christians living in Asia Minor, located in what is today Turkey and part of the Roman Empire. Traditionally, it's been believed that this letter was written about 62AD to Christians facing persecution and marginalization for their faith in Christ. 9. Our lesson from First Peter is part of a bigger section of the letter, running from 1 Peter 2:11 to 3:12. This section is an example of what New Testament scholars call household codes. Household codes existed as a literary form in the secular Roman world. They outlined the duties of subservient persons to their superiors. But in the hands of first century Christian writers, the codes which employed the established literary form discussed responsibilities all Christians had toward one another and toward those with whom they interacted on a daily basis. They envision all Christians, irrespective of their status within society, treating one another with mutual submission: husbands and wives, parents and children, slaves and masters. For the sake of being a positive witness to outsiders and giving non-Christians no cause to reject Christ, the codes commend imitating Christ in relating to all people. The codes that existed in the larger Roman world carried implicit threats of punishment, underscored by the fact that they were never directed at the superior member of a two-person relationship, only at the subordinate. For example, slaves were subject to the typical Roman household code, not the master. But the household codes of the New Testament are significantly different. They might fall under a category of what some Lutherans--including this Lutheran--call the "third use" of God's law. The "law" in Christian terms, incorporating both the Old and New Testament, can be summed up as God's commands that we love God completely and love our neighbor as ourselves. On these two Old Testament laws, Jesus says, all of God's law is built. The law cannot bring a person a right relationship with God or eternal life because none of us is capable of keeping the law. That can only happen through the Gospel, the Good News of Jesus Christ, most famously summarized in John 3:16. 1. The Law is a mirror showing us the true state of our own lives and the distance we are from God, no matter how many religious works we may do or how wonderful we may appear to others. Here, the Law is meant to drive us to Jesus Christ. Knowing that we cannot save ourselves, we turn to Him for salvation. 2. The Law is a check on sin in the world, even among those who have no respect or knowledge of God. The Bible says that God's law is written on our hearts. While we are often deaf to it, we implicitly acknowledge its call for us to love God and love neighbor. As C.S. Lewis says, most human arguments involve disputes between parties, each of whom claim that they're in the right. But unless there were some implicit of understanding of what is right and what is wrong, the two parties would have nothing to argue about. Unless the law was written on their hearts, their tangle would be no different between the battles between two male bucks over a doe or a hyena fighting off a lion, a mere battle of wills and power. Without an agreed-upon set of standards, you couldn't use the term "argument" to describe their confrontation. When oppressive or corrupt governments pull power moves, they may be flouting God's Law, but they always have a rationale at hand for their actions. Those rationales always implicitly acknowledge the existence of some objective standard of right and wrong and claim that they are either abiding by them or that, in a particular instance, a higher standard overrides the one violated. This is what Martin Luther called living in "daily repentance and renewal," regularly bringing our lives before God and, in a process the great spiritual guides called examen, asking God to show us our sins, draw us to repent, and to renew our relationship with God. The Law cannot bring life or forgiveness or hope. Only the Gospel can do that. But the Law, in all its uses, clears a path for the grace of God, offered in Christ. 10. The four major examples of New Testament household codes are Colossians 3:18-4:1, Ephesians 5:21-6:9, Titus 2:1-10, and the section identified in First Peter. These codes, I feel, get misunderstood, misused, and misappropriated. Some Christians, for example, claim that they mandate a male-dominated marriage and family structure. They overlook the mutual servanthood in the codes dealing with marriage. The codes have bigger fish to fry than changing the laws of the Jewish or Roman worlds on marriage, which were tilted to the man. Rather, they subversively posed the question, "Given the realities within which believers may live if married to non-Christians, how can the Christian, particularly the woman, win a hearing for Christ with their spouse?" Some outside the Church and even those within who are trying to score debating points say that the codes endorse slavery. But acknowledgment doesn't confer endorsement. First century Christians lived in an environment in which slavery was the norm. The question before the members of this small, subversive movement that claimed Jesus as Lord was not how to go about abolishing slavery, but how to be a witness and to live faithfully for Christ in the midst of existing society. Slavery was a given. How then to live for Christ if you were a slave or a master? 11. Peter's basic point in our passage is that if you are a slave--slaves are who he is talking to here, as we see in verse 18, just before it--then make certain that you never suffer punishment for doing the wrong thing. Christ is glorified only when we suffer innocently. Let Christ's example hearten you in those circumstances, Peter says. 12. John 10:1-10: As I've said many times in these "passes," context helps us understand content. In other words, we better understand a particular passage of Scripture by noting what's going on the passages that come before it and after it. John 9 helps us understand our lesson. There, Jesus upbraids the Pharisees blind to what the once-blind man saw, that Jesus is Lord. Now, he talks about these blind shepherds who sometimes are misled by those who really don't know the Good Shepherd, confusing their words of religious legalism for the voice of Jesus. His true followers, His sheep, Jesus says, will never be mistaken about Him. They have come to know Jesus well. "I know my own and my own know me," Jesus will say in verse 14. In short, religious fakes can't pull the wool over Jesus' sheep! I'd never heard or seen the name Aline De Walt Reynolds until tonight. For the second time in several days, I caught a particular elderly woman in a movie featured in a movie on Turner Classic Movies. The first was the 1944-released, William Saroyan-crafted The Human Comedy. In it, Reynolds played a kindly librarian. My second sighting of her was at the tail-end of a 1941, James Stewart-Heddy Lamarr film called Come Live with Me. I wondered tonight who that elderly woman was and what sort of a long and venerable career in show business she might have had? She survived the death of her husband in 1905, the San Francisco earthquake in 1906 and raising four children and no money. In 1926, when she was 64 she became one of the most mature freshman ever to enter the University of California. She graduated 6 years later with her B.A. degree. In 1940 she went to Hollywood, where she began her acting career. Best known for her role in Shirley Temple's Storybook production of "Sleeping Beauty". Reynolds lived until 1961, a month shy of her 99th. birthday. Her last acting gig happened in 1960, a live television performance. I don't know about others, but that brief biographical sketch inspires me! Trite as it may be, Reynolds' life confirms for me that it's never too late to take on new challenges! God gives us life. What a shame when we waste it or stop living it! That's the title of this short piece by the ever-amazing Philip Yancey. An eighty-six year old man told me on Sunday, "There has got to be a better way to pick a president than what we've got now." He added, "It's pitiful!" Imagine, for example, where things would stand if Georgia, Alabama and a few caucus states hadn’t moved their dates up to Super Tuesday, but Ohio, Pennsylvania and Texas had, in fact, moved up. This race would likely have been over February 3, with calls for Obama to get out reaching the same crescendo that the calls against Hillary are reaching. Of course, the whole way we got to this position was Obama’s magical “ten in a row” during February. But Maryland, DC, Virginia, Wisconsin, Louisiana, Hawai’i, Maine, Washington and Nebraska were all races that he was supposed to win — and by large margins at that — with the arguable exception of Wisconsin. Imagine if those races had instead been Indiana, Kentucky, Rhode Island, West Virginia, and a couple of Super Tuesday states (say, MA and TN). The storyline would be completely different. This is a criticism of the whole process, not just of how the Democratic primary does things. It's even clearer for the Republican primary. If Florida had been the first GOP state, followed by New York, New Jersey, and Connecticut, Giuliani might have been the nominee. If Iowa had been followed by certain key Southern states without New Hampshire in between, Huckabee would have had a real chance. If South Carolina had been first, followed by Tennessee and perhaps Georgia, we might have actually seen Fred Thompson doing well in other states. If Michigan had been before Iowa, Romney would have had enough momentum that he could possibly have done a good deal better, and if more Western states were early on he might have had enough to get the momentum necessary to take states he lost by a large margin. This process is highly sensitive to small changes in the order of states, and that seems to me to be a very bad thing. Is this any way to elect a President? Back in February, 2005, while guest blogging on MSNBC, Ann Althouse speculated about Condoleezza Rice as a candidate for the 2008 GOP presidential nomination. Those old enough to remember all the way back to 2005, may recall that there was something of a Rice boomlet at the time. As the early months of that year wore on, the newly-installed Secretary of State felt compelled to respond to questions about the possibility that she would be a candidate. Her schedule was scrutinized for events deemed more political than diplomatic. I remember that one of my relatives got so caught up in the Condi for President moment that he stuck a bumper sticker with that sentiment on his pick-up truck. The sticker is still there, but now, the presidential nomination fight well behind Republicans, speculation is that Rice is angling for the vice presidential slot on John McCain's ticket this fall. For McCain to select Rice would, in some ways, represent an act of defiance and chutzpah on the Arizona senator's part. It would underscore his reputation as not just an unapologetic supporter of the war in Iraq, but as one intent on continuing it with the help of one of its primary architects. It would signal that McCain intends to continue the Bush departure from traditional Republican realpolitik in favor of a Wilsonian interventionism in the world. First, because she's secretary of state. In the early history of our country, that was a more overtly domestic political office and secretaries of state were seen as natural presidential timber. Jefferson, Madison, Monroe, and John Quincy Adams all were secretaries of state before going to the White House. Secretaries of state didn't trot the globe. That wasn't just because of crude transportation systems. It was because the "stay at home" country didn't require a lot of globe-trotting from its chief diplomat. This in turn, left secretaries of state more time and opportunity to do the things contenders for the presidency must do for the three years prior to an actual campaign: campaign. Today, a secretary of state's most valuable contacts reside in Baghdad and Moscow, not Boise and Manhattan. Contemporary secretaries of state must accept that, if they want to be President, they will enter the fray with a decided disadvantage. A second reason that it would be difficult, if not impossible, for Condi Rice to become a presidential nominee is that she's secretary of state. In this case, that means that she has spent her lifetime in academia and foreign affairs. What she does is vitally important and she may very well prove to be good at it. But both academia and diplomacy can be arcane stuff and each has developed a specialized vocabulary. It's difficult to imagine Rice talking about bread and butter issues in Scranton or Peoria, isn't it? Even if she did, it would be difficult for her to not sound like a wifty, inaccessible wonk. State-speak may be even more impenetrable than the Senate-speak that many feel hurt John Kerry last year. A third reason I suspect Rice can't be nominated for the presidency is that she's a secretary of state who's never held elective political office. We may occasionally elect a general to the presidency without the benefit of elective political experience. Think: Ulysses S. Grant and Dwight Eisenhower. But we have never elected a former secretary of state to the presidency who hadn't first been an elective office holder. We may argue with that seeming prejudice. But it's there nonetheless. Americans like their presidents to be people of action. Whether it's unfair or not, diplomats are not seen as people of action, no matter how esteemed they may be. But as a diplomat and secretary of state, Adams felt less constrained to stubbornly dig in. For him, diplomacy was primarily an academic discipline, which suited him intellectually and tempermentally. (It's interesting to note that when, as secretary of state, Adams made his most important policy pronouncement, he did so wearing academic regalia.) He is considered by many to have been our finest secretary of state. That didn't serve him well as president. The reasons I advanced for Rice not being a presidential contender apply to her as a vice presidential candidate. I'm not sure that she will connect with voters and I'm doubtful about what state she can bring in for the Republicans in the fall, the most critical political question regarding a vice presidential running mate. Carol is a member of Saint Matthew Lutheran Church in Logan, where I'm privileged to be pastor. She's started a a new blog featuring both her thought-provoking writing and photographs from our beautiful Hocking Hills. Check out Carol's blog here. I love surprises! To me, as a kid, at least half the joy of getting to the tree on Christmas mornings was associated with not knowing exactly what I was going to get...and then being surprised! For Jesus’ earliest followers, the first Easter was a bit like Christmas morning was for me while growing up. Every time they turned around, they were getting surprised, sometimes shocked. Our Gospel lesson for today, which takes places in the afternoon and the evening of the first Easter, documents several of the surprises God gave them...and us...on that day. But there were more surprises in store. In our lesson, two of Jesus’ disciples left Jerusalem, heading for the village of Emmaus, about seven miles away. Naturally, they talked about recent events, not just the report of Jesus’ missing body and of His resurrection, but the shocking surprise they’d gotten a few days before when the Teacher they thought would go to Jerusalem, overthrow the Roman government, and establish Himself as an earthly king had instead refused to fight and gone uncomplainingly to a terrible death on the cross. Not only did they grieve Jesus' loss, they also were grieved that all their hopes, things they’d hoped and worked for over a period of years, had been so violently and abruptly dashed on the previous Friday when Jesus died a humiliating death as a condemned criminal. Many of you here this morning know exactly what they felt as they mourned. You too, have had the hopes and dreams toward which you've worked suddenly destroyed by circumstances beyond your control. That's how these two disciples felt. It's in the midst of their discussion that the two of them got their next surprise: A man suddenly started walking beside them and asked what exactly they were talking about. You and I know that this is Jesus. But the disciples, prevented, I think, by their unbelief, can’t recognize Him. There are times in our lives too, when the risen Jesus is working in our lives and we don’t even know it. True story which I first read in Billy Graham’s book, Angels: Some years ago, a man woke up in the middle of the night, a feeling of terror overwhelming him and a strange word throbbing in his brain. Pray for this word, he sensed God telling him. The man prayed, with no idea why. After awhile, he sensed that his mysterious prayer assignment was completed and he went back to sleep. Months later at worship, he met a missionary who was at home on furlough. When he heard the name of the village in Africa where the missionary served, the man was dumbfounded. The village’s name was the word he was awakened to pray for that night! He later learned that at the very hour he had been praying, that village was under attack by a neighboring tribe. All the people had gathered in the village church and the missionary had urged them to pray that God would send help. Shortly thereafter, the hostile tribesmen simply walked away. Some time later, all the members of that hostile tribe came to faith in Christ and the missionary asked them why it was that on the night of the attack, they had simply left. “It was those men,” one of the tribesmen said. “What men?” “Those warriors who surrounded the church. We were afraid of them.” The missionary and the praying man from the States concluded that on the night of that attack, God had roused many to pray so that He would have the invitation He wanted to intervene, save that village, and even make it possible for those who’d had murder on their minds to receive forgiveness and new life through Jesus Christ. You never can tell when the God we know through Christ will, as was true on that road to Emmaus, walk beside us! But the two disciples got another surprise. When this stranger seems ignorant of the events the disciples have been discussing, they can hardly believe it. After all, Jesus’ crucifixion hadn’t happened in some obscure corner. The Jewish historian Josephus, a Roman historian who lived from about 37 to 100AD mentioned it in his exhaustive history of the Jews. Anybody in Jerusalem that Passover week would have known about Jesus’ trial, suffering, and executtion. “We had hoped that he was the one to redeem Israel,” the two disciples tell Jesus, their grief and disappointment in evidence. Jesus must have surprised them with what He said next: “Oh, how foolish you are, and how slow of heart to believe all that the prophets have declared! Was it not necessary that the Messiah should suffer these things and then enter into his glory?” And then this mysterious stranger explains how Jesus’ death and resurrection had always been the centerpiece of God’s big plan to make it possible for everyone in the whole world to turn from sin and believe in Jesus and so, live with God forever---all of it revealed in the Old Testament. Jesus surprised them with the Word of God! Later, the disciples remarked to each other how their hearts were on fire when they listened to Jesus discuss God’s Word. God’s Word still has that power! I used to get lunch at a deli in Cincinnati and got to know its owner, a man from Syria, a Muslim. We became friends. One day, I was in the deli and he told me that his brother-in-law had died, a victim of suicide. Would I come to the funeral visitation?, he asked me. I was honored and happy to do so. I showed up several minutes before the visitation actually began and sat down to talk with my friend. "Mark," he said to me, "I'm a Muslim. What do you as a Christian believe happens to us when we die?" I began to talk about what the Bible teaches happens for all who believe in Christ, how we are saved from sin and death by the grace of God, given in Jesus Christ. I went on for some time like that, stopped myself, and apologized for going on so long. He touched my arm and said, "No! Don't apologize. That made me feel good to hear." That man felt good not because of me, folks; that was because of the power of God’s Word! In the Bible, God's Spirit touches our spirits, the life of the risen Jesus touches our lives. No other book on the face of the planet has the power of the Bible, because the Bible is the place where we come face-to-face with God! The risen Jesus can pierce our thick-headedness and our slow-heartedness and surprise us with His love and power when we spend time reading and soaking up His Word each day. But, if you’re as thick-headed and slow-hearted as me, compelling as God’s Word can be, sometimes it isn’t enough to pierce our sloughs of despair, our inability to believe, or our willful rebellion. We've spoken of several surprises those two disciples got on the way to Emmaus: the surprise of this man--who we know was Jesus--walking beside them and the surprise of having the mysterious stranger sharing the Scriptures with them in a way that caused their hearts to passionately burn within them. But they got another surprise. 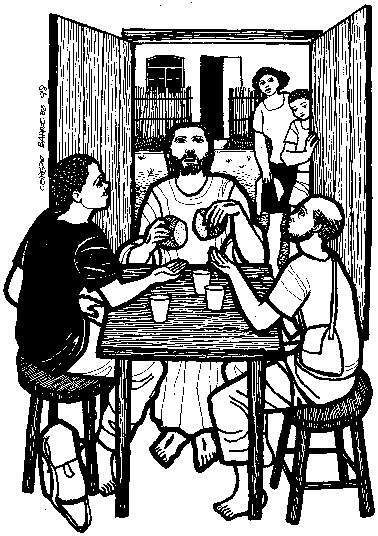 In the breaking of the bread, the two disciples now could see that it was true: The Lord Who had gone through the same ritual when He fed the 5000 and later in the Upper Room when He instituted the Lord’s Supper, enacted it again. There was no mistaking that Jesus had risen and was with them. The breaking of the bread made it unmistakably true. Author Richard Farrar Capon talks about Holy Communion as “the hat on the invisible man.” We can’t see Jesus right now. But when the Word of God—God’s Word of promise to those willing to receive Jesus—meets the bread and the wine, Jesus will be among us and we will receive forgiveness in His Name. When the Emmaus disciples finally recognized the risen Jesus, He vanished from their sight. But they knew for sure that they weren’t alone. So, these once forlorn figures who’d been so afraid of the dark that they’d convinced Jesus to stay with them for dinner, immediately traveled the 7-miles back to Jerusalem to tell the other disciples that it was true: Jesus was alive! I love surprises! So here’s another one for you to consider. Do you know the holiest part of our worship together? It doesn’t happen at the altar, holy though what happens there is. It isn't in the reading of the Word or the singing of praises, though those are certainly holy moments. The holiest moment happens at our church doors. It’s when, after we’ve received God’s Word and the Body and Blood of Jesus and go into the world to share the same message with our neighbors and friends that the two disciples from Emmaus shared that first Easter evening: Jesus is alive! And it’s still something everyone in your life needs to know! So, my message to you this morning about that good news is quite simple: Spread it around. A cold has me awake way too early. I found this little gadget on Chris Cilizza's Facebook site. Have fun!